I feel like everyone has seen Jurassic Park. Or at least one of the 4 movies. And no, this isn’t sports related. You know the story. Humans find dinosaur DNA in a mosquito that’s been preserved in hardened sap. Humans take that DNA, combine it with another animal’s DNA, and – BOOM – we’ve got a dinosaur. That was only a movie / novel, until now. No, they’re not making real dinosaurs (yet), but they are going to create a woolly mammoth (which went extinct 10,000 years ago) thanks to DNA from a mammoth that’s been preserved in ice for 42,000 years in Siberia. Harvard University scientists – who are set to publish scientific papers in the coming weeks – are using DNA from a woolly mammoth that has been preserved in Siberian ice for more than 42,000 years. If the two-year plan came to fruition, the woolly mammoths would live in a 20,000 hectare Ice Age safari park created by Russian scientists in a remote part of Siberia. This could also regenerate Arctic climates because they would stimulate the growth of vegetation, the lead researcher has said. Their ambitious plan involves growing the creature within an artificial womb rather than recruiting a female elephant as a surrogate mother. Isn’t that how they created the Indominous Rex in Jurassic World? The one that rampaged and ate a bunch of people, etc? That’s just the elephant. Who knows what the traits of the mammoths are?! Researchers are using a genetic technique called CRISPR-Cas9. The system allows the ‘cut and paste’ manipulation of strands of DNA with a precision not seen before. ‘We have already revived dozens of genes and are testing them in elephant cells’, lead researcher Professor George Church told the Sun Online. ‘We are focusing on a reviving mammoth genes and making a mammoth/elephant hybrid and help them spread to vast wild, arctic climates’, he said. According to Professor Church, these large beasts could even repopulate freezing wastelands. I see “help them spread” and I immediately foresee something going wrong. Something is going to get screwed up here. 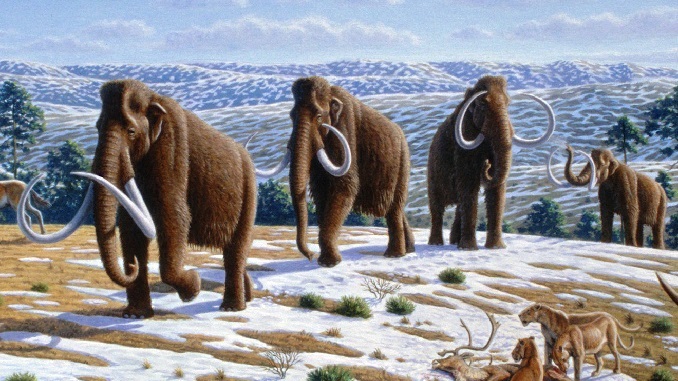 Woolly Mammoths went extinct over 10,000 years ago. Scientists may think they know everything there is to know about creatures from back then, but how in the world could they “really” know? Basically, what researchers and scientists get from old fossils is an online dating profile. Oh, the mammoth likes long walks on the beach, romantic dinners, going to funny movies, etc. The dating profile doesn’t mention “jealous, violent prick” or “doesn’t feel the need to answer the phone” or whatever. I’ll admit, this is interesting… but I’m expecting something to happen eventually, and I’ll point back to this article for it.